It’s National Scrapbook Day and Happy Birthday to “The Soup Bowl”!!! Woot! Woot! Obviously, I have a great deal of passion for this industry! You guys have been so great in supporting me and Jillibean Soup! Can you belive my blog is a year old already? It was a little over a year that I started “The Soup Bowl”. I was still developing my first paper designs. I was hoping the blog would be a way for me to relate to the everyday scrapper. 50,000 hits later – I guess it helped. 😉 You’ll get some laughs if you check out some of my early posts here and here. Thank you bunches for your support through the past year! As a tribute to National Scrapbook Day and “The Soup Bowl’s” 1st anniversary, we’re doing an awesome giveaway! The girls and I (DT) have had great support from some industry leaders. I want to offer you some product from Jillibean as well as some from our scrapbooking friends! Woo Hoo! 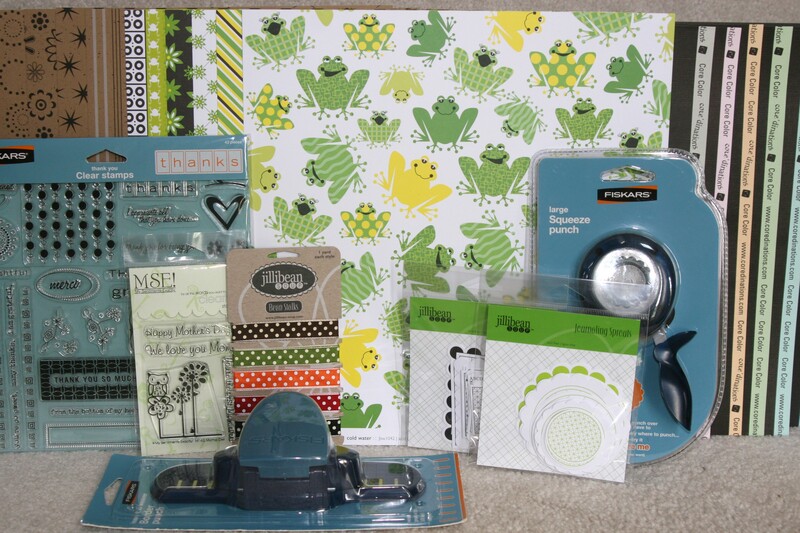 I think I see some Jillibean, some My Sentiments Exactly stamps, some Core’dinations cardstock, and some Fiskars tools! All you have to do to enter this giveaway is leave a comment. Tell me why you’re having a great “National Scrapbook Day”! I will pick a winner on Wednesday May 6th at 9:00pm EST. Good Luck and a HUGE thank you to all of you for your support!!! I’m lucky enough to be cropping with a very fun group of ladies! Happy NSD to you too! I’m having a great NSD, because I actually get to scrap today! I am having a great day because I have a chance to win some of your awesome scrapbooking stuff. What could be better than that? Wow — great giveaway and your products are hot — I see them popping up on blogs and in magazines all the time! I plan to celebrate with my neighbor this afternoon during naptime for the kids — scraptime for mommies! 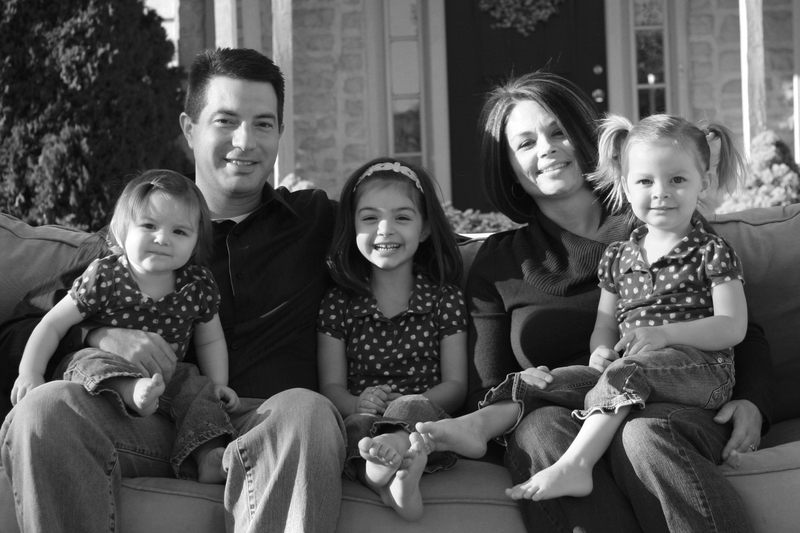 I’m spending some scrappy time today…while enjoying the beautiful Spring weather outside with family!! I’m having a great day because I will be scrappin’ with my girl AND it’s a BEAUTIFUL day outside! It is a great day to be inspired by all the blogs and LOs out there to celebrate NSD! Thanks for the chance! I am having a great NSD b/c I get to stay home, relax, surf blogs and create! I love that there is a day devoted to scrapbooking! That is really cool:) I’ve got some great photos that are just begging to be scrapped! NSD is such a great annual tradition! I wish I could participate more today in all the scrapping activities, but I’ve got kids to handle at different sporting events and hubby’s out of town! Still, I’m enjoying stopping by my fave blogs to see what people are up to, and I do actually have some pictures to scrap – maybe ONE LO tonight?? And that, my friends, makes me happy. 🙂 Happy NSD! Its’ great because I get to make cards all day. What could be better? Just having the opportunity to be creative, and enjoy this day – I’ve missed the last 3 years for various reasons! Today is a great NSD because all of my family members are in other parts of the house or outside doing their own thing….. which is great as it leaves me free of obligations! I can scrap to my hearts content……. (or play around on computer!!) Thanks…. I am lovin your products and seeing them more and more! I am enjoying a nice day at home scrapbooking and searching online for tons of ideas. I got married just 3 weeks ago today and I am going to start scrapbooking our wedding album. I love that paper with the frogs on it. I LOVE frogs. Have a great day and Happy NSD. Of course it is a great day…it is the weekend, it is NSD and I got some great shots of the kids playing baseball and softball today to work with. Life is great!! Happy NSD and thanks for the chance at a great looking prize! I am having a great NSD b/c I found lots of great deals on supplies for my cards today and made a couple and sold a few today too! I’m having an awesome NSD b/c it’s a beautiful day and my hubby is busy boating with his buddies. The kids and I joined him for the morning and got lots of sun and fresh air. Now they’re cleaning up in warm bathes and I’m scrapping. Have a couple hours till dinner and then after dinner I’m free to scrap again because it’s ‘Hockey night in Canada’ so DH will be busy for a few more hours. Love it! Hanging out, making some cards. Thanks for the RAK! I’m having a great day because I am about to go watch my brother-in-law marry a lovely lady! Hmmm, well I didn’t do any scrapping today but I did visit my favourite scrappy store so that was enough to make my NSD fabulous!! Great giveaway – thanks for the chance to win!! Wow! Great giveaway! Today was a great day all around not only because it was NSD. My hubby had his first Saturday off in a really long time and we got to spend it together. One of our stops today was to the LSS where I picked up some goodies. I haven’t scrapped at all today but I’ve got some great stuff for when I do. I was happy to give up a scrappy day to spend time with my sweetie! Happy NSD! I did a bunch of scrapping today. DH took the kids outside to garden and I was very productive. So much fun! Thanks for the chance to win that awesome giveaway! I had a great National Scrapbook Day because I was able to spend it with my very dear friends at my favourite scrapbook store. I made four beautiful cards, ate some yummy food, and was able to pick up some fabulous products at great prices. Then I came home and had time to scrap some fun layouts with some of my favourite lines — including a layout using Jillibean!!!! I am very lucky to be scrapping all weekend with some old friends that I haven’t been able to see for awhile. Happy National Scrapbook day! I was lucky enough to get some scrapbooking done with a group of friends. I even used some JBS products! Thanks for the chance to win. Could always use more JBS stuff. I’m making it a weekend of scrapbooking! I’ve only got a couple projects done, but that’s good for me. I love all the ideas posted on the web from people all over the world! Thanks for the chance to win, your so generous! It was a great National Scrapbooking Day because I got to organize some photos and take more of my son for prom night! Thanks for the chance to win the awesome give away! Here’s to many more NSD with Jillibean Soup! Well, I’m not actually spending my weekend scrapping like I had hoped, unless you count the one little card I made this morning while the boys were still asleep. I am spending it doing something that I enjoy just as much and that’s spending time with my boys. Hope everyone is enjoying their NSD with friends or on their favorite message board! I’m definately enjoying NSD and making it last today too! I’ve been trying to work on some challenges as well! Happy NSD to you! Not scrapping much…but reorganizing my scrapbook area because it HAD to be done and I thought that was a good goal for NSD! So while I am not enjoying NSD as much as if I were scrapping…I will soon be enjoying a newly organized and purged desk! Have yet to do any scrapping this weekend, but have surfed the scrap net quite a bit. I took the kidlets to Build a Bear last night so I guess that is somewhat creative…lol. I ran a half marathon today with some friends. I’m celebrating that I finished!! I had a great “National Scrapbook Day” croppin’ with Jillibean! thanks for the great chance for some awesome product! i spent NSD with 12 great ladies scrappin’ the day away!!! I spent NSD at home doing a lot of creating! We also had a birthday party for me, my husband, and my SIL. Great day!! I had a great National Scrapbook Day because I now have my very own live-in scrapbooking partner with whom to share supplies and encourage each others’ scrapping adventures. I didn’t scrap on NSD but I attended two very scrap-worthy events and took pictures: a 1st Communion and my sorority reunion!! I had a good NSD because I attended a crop at a LSS, where I finally managed to finish the heritage album I’ve been making for my dad and intended to be a surprise 60th birthday gift for him LAST year! (A year late, but better late than never? ;b ) Hope you had a good one too! Thanks for the opportunity! The NSD it was great because i teached how to scrap to my bestfriend and now she’s scraping all day!!! one scraper more!!! I had a great NSD Day with my online friends! I didn’t get alot of scrapping done but (like I do when I go to crops) I did do alot of visiting and chatting! i was at a local scrapbook store celebrating NSD… had tons of fun playing games and hanging out with everyone… and strangely enough, after all the activities, i even finished 3 layouts!!! yeah! hope you had tons of fun also 🙂 thanks for the opportunity.